Man’s incompleteness was a recurring theme in Gurdjieff’s teaching. “Our starting point is that man does not know himself, that he is not,” he used to say, stressing that undeveloped man utilized only a fraction of his capacities and powers. Undeveloped man was an unfulfilled potential, a carriage without a driver or a house without a master. Practical work had to focus on becoming, for with man’s coming into being, he would acquire remarkable powers such as will, consciousness and unity. Foremost, he would become real, like the wooden Pinocchio transforming into a real boy. A fully developed man would shed the mechanical strings of stimulus response and become master of himself. This was the ultimate and unflattering reward of the Fourth Way, the simple luxury of being one’s real self. In the coming series of posts, we will explore what it means to be. Be is a command, and being is achieved by intelligent effort. It could be seen as a prayer, but whereas religious prayer calls to an outward divinity, the invocation to be calls forth one’s better Self. Results are proportionate to understanding. The call to be is only as good as the meaning attached to it. If a precise and practical meaning accompanies that command, be becomes a tool of awakening, a reminder of one’s greater aim and a spark that invites one’s past efforts to illumine the present moment. A spark must be fueled and the command to be must be amplified. Gurdjieff designates the solar plexus—the seat of the emotional center—as the vessel responsible for such amplification. Left alone, the word dissipates, just as all words do when mumbled in sleep. But amplified by emotion – desire and conviction – the command be combusts into the state of being. External expressions of this inner process can be seen in temple architecture. Many Buddhist caves, for example, are constructed in such a manner as to amplify the words chanted within them. 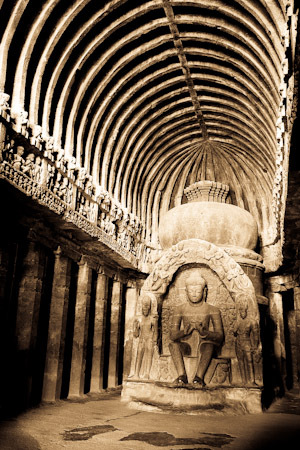 This Indian Buddhist cave in Ellora even has the appearance of a human rib cage. The Buddha is seated at its center. His hands gesture the Dharmachakra Mudra, signifying that he is teaching. 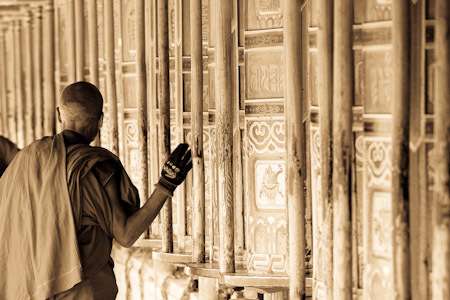 What might the Buddha be instructing his students? In Hindi, the equivalent of command be is Om. To chant Om, the lips must seal to form the ‘m’ sound, and in so doing, inevitably form a vibrating hum that reverberates loudly within the ‘temple’ of the solar plexus. As without so within: in the very same manner, the command to be—amplified by intelligent emotion—permeates a man’s inner world and calls his real ‘I’ into being.